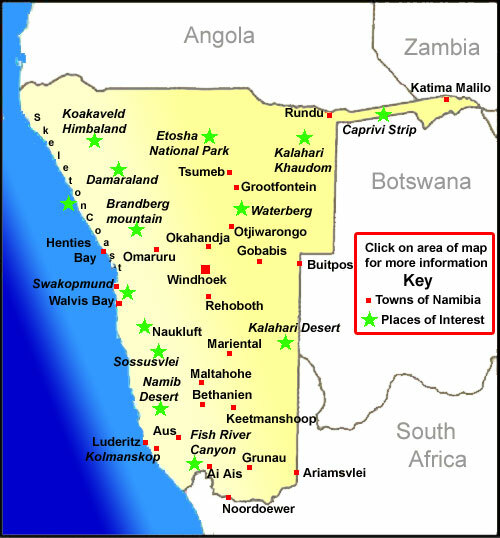 Where to stay in Namibia, what to see and where to go, accommodation in Namibia is clean and safe and there is plenty to choose from including camping, self catering chalets, guesthouses, villas, bed and breakfasts, lodges, hotels, bushman camps and more accommodation in Namibia is as varied as the landscape. Namibia is a large and beautiful desert country on the South west coast of Africa. Namibia has fascinating geography, history, cultural and wildlife, making Namibia a wonderful place for an exciting holiday. Namibia is predominantly a desert country with approx 310 days of sunshine each year and Namibia is often referred to as the land of contrast with breathtaking mountains, deserts, amazing wildlife and fascinating culture. Memories of Namibia will forever remain in your heart. The Namib Naukluft Park is the central part of the Namib Desert. Sossusvlei, Sesreim Canyon & the Namib deserts beauty make it one of the most popular places on any vacation to Namibia. Enjoy amazing sunrises from the top of the sand dunes. The gate to Fish River Canyon is situated at the rest camp Hobas. From there, you have to drive another 10 kilometres to the actual Canyon which offers a stunning view of "Hell's Bend". Fish River Canyon itself is approximately 180kms long. Kaokoland is a true wilderness area in the far north west of Namibia. The Kaokoveld is a rugged wilderness for the intrepid adventurer, accessible only by 4 wheel drive the rewards are fantastic with unreal landscapes and of course the Himba people. The remote and awe-inspiring Caprivi Strip in the north east corner of Namibia has woodlands, rivers, delta and swamps, The Caprivi Strip is usually a complete surprise for the first time visitor! Contrasting with the rest of the country the wetlands offer an amazing abundance of water. 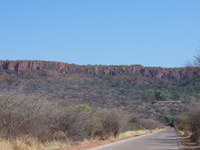 Waterberg Plateau located only half a days drive from Windhoek and is a pleasant escape into the peace of the bush, game drives area available onto the plateau and the bird life is stunning in this area. Close by is the AfriCat Foundation known for its work with predators in Namibia. Swakopmund’s temperate climate offers respite from the searing heat of the desert, a friendly, busy seaside resort with German style architecture and lovely seafood, it allows you to indulge in a variety of ocean activities and adrenaline adventures. With all the modern conveniences of a city, Windhoek usually marks the start or end of any trip to Namibia. It is a clean compact city with its founding history entwined with modern business. Street cafes are an enjoyable way to spend an afternoon. A town seemingly disconnected with the rest of the world at the end of the road Luderitz is an old fishing town around a harbour rugged, the coastline hides seals Penguins, sharks, shipwrecks and diamonds... visit deserted Kolmanskop to learn about them. Namibia Wildlife Resorts or NWR is the sole tourist accommodation operator inside most of Namibia's National Parks. Operating accommodation inside Etosha Park, Namib Naukluft Desert, Fish River Canyon, Waterberg Plateau Park, Skeleton Coast, Popa Falls, Shark Island, Duwisib Castle and Gross Barmen. In the south of Damaraland Omaruru is a quiet pleasant town with fuel and supplies good base for exploring the area. In the heart of Damaraland with views of Brandberg this small ex-mining town is a great base to explore the area. Namibia's main port Walvis Bay is 30km south of Swakopmund and has good access to the coastal areas as well as the desert. Namibia is a land of beautiful contrasts with its abundant and adaptive wildlife, dramatic pristine remote landscapes, friendly people and amazing diversity. Namibia is a large country 824, 269 square kilometres (approx four times the size of the UK) but Namibia only has a population of 1.83 million people, this makes Namibia one of the most sparsely populated countries in the world. Namibia is a wonderful destination in itself and can be easily combined with a trip to South Africa, Victoria Falls or Botswana. Namibia undoubtedly has some of the most pristine, remote and dramatic landscapes in Africa. First impressions of Namibia are usually of a hot and somewhat harsh land, but you will soon find Namibia is an enchanting country full of life in the most unexpected areas.